Find a list of best restaurants in London area in the UK. Find all types of restaurants – Bengali / Bangladeshi, Indian, Japanese, Thai, Lebanese, Caribbean and more. Area Covers : West End London, Mayfair, Covent Garden, Canary Wharf, City of London, Piccadilly, Soho, North London, West London, South East London, South West London and East London. – North London, King’s Cross area restaurant. The perfect place to meet, eat, work or relax. One of the oldest French restaurants in the heart of Angel in Islington. Serves french cuisine and offers breakfast, lunch, dinner, coffee and drinks. 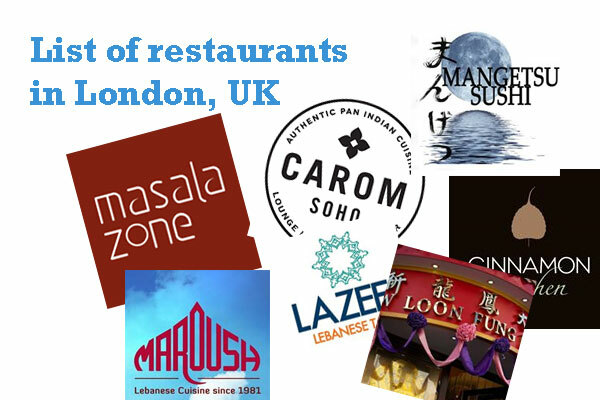 Maroush Group of Restaurants that has been serving Londoners fine authentic Lebanese food since 1981. Serves Lebanese, Moroccan, Fusion foods. Hard Rock Cafe London – Family Style Restaurant, Bar and American Restaurant. Hard Rock is a haven for fans of music, food, and great times. – Located in Tufnell Park, the best home-style Ethiopian food since 1993. Page updated : 22 March, 2018.